When Chanel's Peridot Nail Lacquer was released in the Fall of 2011, I had a serious urge to invest. Being an August baby, I fell in love with the name and couldn't keep my eyes off the memorizing duo-chrome bottle. Looking back, I am very proud of myself for resisting the temptation because I cannot justify buying a $30 nail polish in a very unusual shade, to say the least. 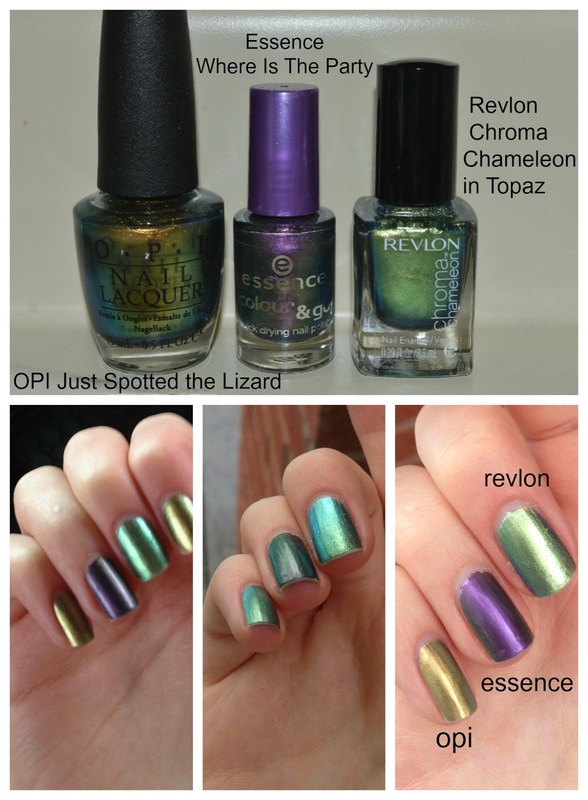 Just a few months later, for Summer 2012, OPI released Just Spotted the Lizard in their "The Amazing Spider Man" collection. For $8, I couldn't pass up this identical Chanel Peridot duplicate. Since then, I have collected two other duo-chrome nail polishes. Essence Where Is The Party is more purple toned and Revlon Chroma Chameleon in Topaz is more blue-toned. OPI is more gold-green compared to the other two. Here are some swatches to compare. As you can see, all three shades have similar and different effects when viewed at different angles and in different light. That is the essence of "duo-chrome"- two different coloured chrome pigments in one polish. Although these duo-chrome nail polishes quite the attention-grabbers, they have a beautiful effect and are easy to apply. OPI is the smoothest and is around $8. Essence is a bit more dull in chrome pigment but is very affordable at around $1. These skinny bottles are now discontinued though. The Revlon Chroma is the least smooth in application but has the shiniest appearance when dry. It is around $7 retail price. I do believe they are all limited edition shades, therefore they could be difficult to find in stores. Many online retailers do stock limited edition OPI shades. Are you a duo-chrome fan?